These six pathways represent ways to structure and achieve NCEA Level 2 by providing a more coherent framework for foundational vocational education; students can develop their own individual education plans, are better informed and able to make better choices to meet their goals. 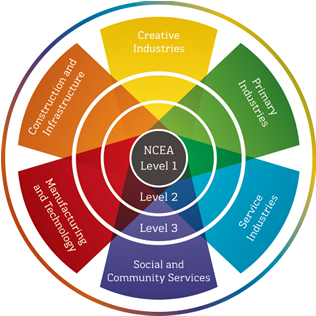 Government agencies, the industry training sector, secondary and tertiary representatives and industry and employer representatives worked together to develop the six Vocational Pathways for NCEA Level 2 as the foundation of the journey to employment. These groups are now in the process of developing pathways through qualifications achieved in NCEA Level 3 and beyond. The Vocational Pathways Award exists at NCEA Level 2. This enables employers to assess whether potential employees’ skills align with their industry requirements more easily. To receive a Vocational Pathways Award, students must first gain NCEA Level 2, which is 60 credits from Level 2 and 20 credits from any other level; 80 credits in total. 10 of these 80 credits must satisfy the literacy requirements, and 10 of these 80 credits must satisfy the numeracy requirements. To get a Vocational Pathways Award, 60 of the Level 2 credits must be from the recommended standards in one or more pathways, including 20 Level 2 credits from sector related standards. The Vocational Pathways Award(s) will be awarded to students on their NZQA Record of Achievement. This will be a real advantage when they look for work and training opportunities in the sector.